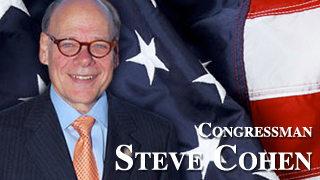 Congressman Steve Cohen is a fourth-generation Memphian who has dedicated his life to public service. Upon election to the U.S. House of Representatives in 2006, Congressman Cohen distinguished himself on the Hill for his thoughtful legislation and quick wit. Nancy Pelosi even referred to him as the “conscience of the freshman class” in 2008. His goal is as it has always been: to ensure that everyone – regardless of race, class or creed – has the opportunity to achieve their American dream.